These three will be huge industry players for years to come -- and each has a distinct demographic. Many supermarkets look the same, but these three stocks to watch are clearly the leaders. Photo: Linsinsuppe, via Wikimedia Commons. There are tens of thousands of supermarkets dotting the American landscape -- from mom-and-pop operations to huge multi-nationals. Some focus on offering the cheapest fare possible, others zero in on health-conscious clientele with more money, and many fight for the large space in between. But when it comes to investing in this steady sector, there are only three major players you really need to know about: Wal-Mart (NYSE:WMT), Kroger (NYSE:KR), and Whole Foods (NASDAQ:WFM). While some might scoff at the idea of investing in supermarkets, these three have performed well since the Great Recession. While Wal-Mart lags the other two, that's not as much of a surprise given the company's huge market cap. Moving forward, there's good reason to believe that these three will continue being the stocks to watch in the industry. Most people associate Wal-Mart with offering up low-cost merchandise that generally has nothing to do with food. But starting around the turn of the Millennium, executives began a vast process of remaking their stores. Groceries became the central item that would entice shoppers to keep coming back to Wal-Mart. The amount of distribution center, or DC, space devoted to groceries at Wal-Mart has exploded. Source: MWPVL. Since then, sales of food at Wal-Mart have exploded. In 2014, the company had over $270 billion in groceries sales -- which equated to 56% of all dollars spent at the chain. Even more astounding, this means that roughly one of every four dollars spent on groceries in America is collected by Wal-Mart. Moving forward, the company is going to continue focusing on value-oriented shoppers who aren't too picky about the quality or sourcing of their food. That being said, Wal-Mart is getting in on the organic game as well. Last year, the company began offering low-priced organic goods through a partnership with Wild Oats. It is yet to be seen what kind of impact the organic offerings will have for the company. On the other end of the spectrum is Whole Foods. Long-dogged by the "Whole Paycheck" moniker, the company has come to represent a very progressive stance toward food. By focusing keenly on the in-store experience, and spending lots of time and money educating the consumer about where his/her food came from, Whole Foods has definitely won the loyalty of many well-heeled shoppers. The store boasts some of the best operating metrics of any publicly traded stores. Mature locations average over $1,000 of sales per square foot every week, and the company has long been able to achieve net profit margins above 4%. Both would be the envy of a traditional grocer. But recently, increased competition from a number of smaller operations, as well as a perception that the stores are "too expensive" for younger shoppers has caused the company to pivot. While management still believes it can build 1,200 locations nationwide (up from today's 414), it will also be opening a new chain next year. While details about this new chain are still scant, it appears that the company will focus on a smaller store size and only offer the very best selling products. Combining this lower overhead with a focus on technology that should require fewer employees, Whole Foods will be able to offer low prices while capturing more of the very-coveted Millennial crowd. 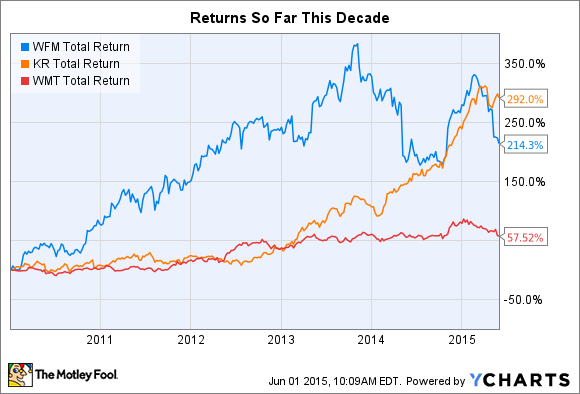 The great surprise of the past decade among grocery stocks has been Kroger. While many traditional grocers -- those who fall somewhere between the ultra-discounting Wal-Mart and the wealthy Whole Foods -- have lost market share and gone out of business, Kroger has been able to flourish. It has done so by taking a two-pronged approach: acquiring smaller rivals that have a presence in cities where Kroger was not yet established, and aggressively pushing organic foods at price points equal to -- or lower than -- Whole Foods. The strategy has paid off beautifully, as identical store sales increased by 5.2% in 2014. That's an astonishing feat for a company with over 2,600 locations. Sometime in the near future, the company is expected to eclipse Whole Foods as the number one seller of organic goods in the United States. In the end, investors wanting exposure to food sales -- which represent a very resilient industry during tough economic times -- need to start with these three players. All three offer up dividends -- and while they aren't very hefty right now, they are all safe and should be around for years to come.